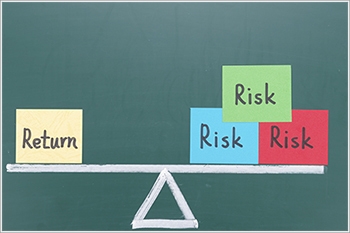 What is Risk: When most investors think about investing, they first think about risk. While the financial markets and experts define risk as a mathematical number (e.g. volatility), common investors think of risk as possibility of losing their investment (fully or in parts) or making less than expected returns. What is Risk profiling: An investor makes investments in order to achieve certain financial goals. A risk profile helps an investor understand how much risk they can take vs how much risk they should take to achieve their goals. Risk capacity: Level of financial risk that an investor can manage comfortably based on his life situation (e.g. risk capacity will be higher for a young salaried investor vs a middle aged man with two children). Attitude to risk: Investor understanding of the concept of risk and how it applies to their financial life. Risk requirement: Investor’s financial goals to understand where they are headed and their current resources to identify risks they may be required to take up to achieve certain goals (e.g. invest in equities to plan for retirement). There are multiple risk profiling tools that are available online and you can use them to get your risk assessment done. Upon completion you will be put into one of the risk buckets depending on your responses to the given questions (e.g. low risk taker, medium risk taker, high risk taker). Once you know your risk profile you can determine what kind of investor you are, what kind of returns you should expect from your investment portfolio and what kind of investment portfolio you should have. Take the right risk – as per your capacity and requirement. Tapping suitable investment opportunities – get to know the right investment asset mix depending on your risk profile (e.g. appropriate balance of stocks, bonds, derivatives, different types of mutual funds, etc). Readiness to manage surprises in returns – you are more aware of how you may react and how best to keep your emotions from getting in the way. Conclusion: Risk profiling is extremely useful for all investors, but even more so for beginners, as it helps set the right investor expectation and gives an excellent opportunity for advisors to get a glimpse of their client’s aspirations, attitude and tolerance.